When opening Neural Designer the editor window is shown. This component lets you create and set your projects. The following figure shows the start page of the editor window. 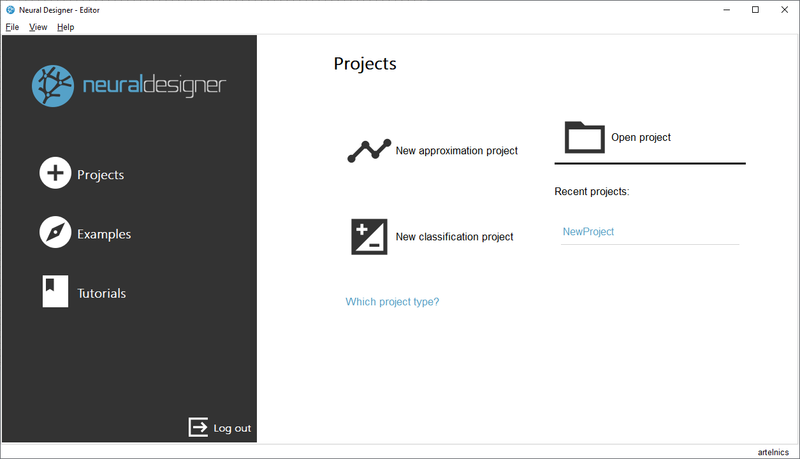 The Projects pane allows you to create a new approximation or classification project, or open an existing project. More information about approximation and classification tasks can be found in the Neural networks applications article. The Tutorials pane redirects you to the online 6 step neural networks tutorial. 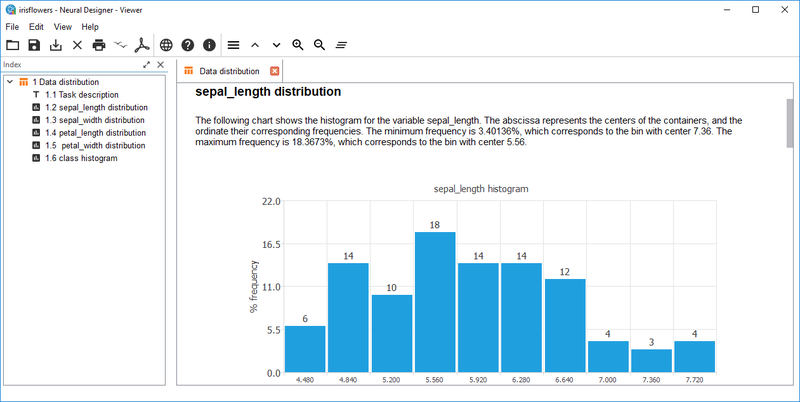 The Examples pane opens worked projects made with real data. All of them are documented in the Neural Designer Examples section. Opening, for instance, the iris Flowers example, shows the main view of the editor window is shown. A data book with data set, neural network, training strategy and model selection tabs. It contains the settings for all the components needed to solve a given application. Default values for all the settings are provided by the software when specifying the data file to work with. 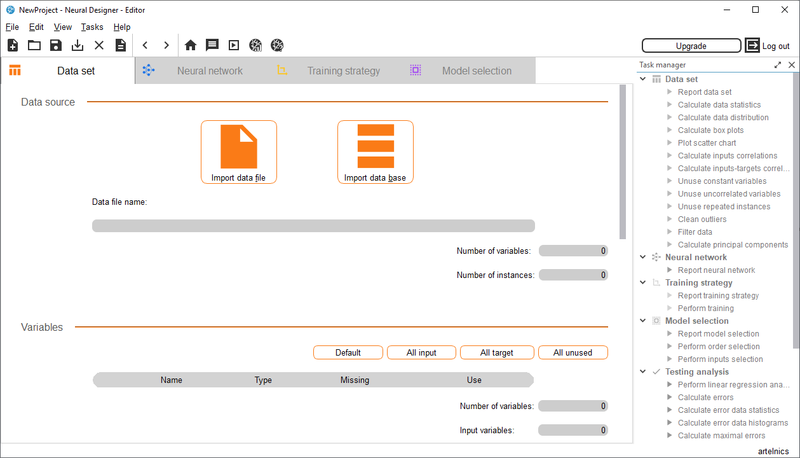 A task manager with data set, neural network, training strategy, model selection, testing analysis and model deployment tasks. It contains a list of tasks for each component to be run by the artificial intelligence engine. Some tasks need additional information which is required to the user via dialogues. An output pad for the editor, the engine and the viewer. Most information, warning and error messages will appear here. The artificial intelligence engine allows you run tasks. That application does not have any window, but it runs processes in background. Tasks are called from the task manager in the editor window. When you ask the engine to carry out some task, the results can show up in different places: (i) New settings will show up in the editor window. (ii) Tasks results will show up in the wiewer window. If some settings are inconsistent, then the output viewer in Neural Editor writes an error message and the task is not executed. If during execution, a task throws some error, it will be also written in the output viewer. The viewer window shows you texts, tables and graphs you create by running tasks. It is started automatically when running any task from the editor window. Running, for example, the "Calculate data distribution", opens the viewer window with the corresponding results. A tree view with the index of the report. Here every section corresponds to a task run by the engine (but the project description, which can be edited in the editor). Each subsection corresponds to a single description, table, chart, etc. A contents pane, which collects your descriptions, tables, graphs, etc. You can also start the viewer window by opening the output file that you need to work with (.ndo file). Neural Viewer also allows you to export your results to a PDF file, or print them. Also you can export any table and graph as PNG or CSV by right clicking on it.